If you're interested in reading more on ideas presented in the article below, I suggest reading Simple Steps to Foot Pain Relief. If you'd like movement instruction via video, start with Alignment Snacks: Stretching the Standing Muscles. Well, I'm not really a subscriber, but I have a lot of awesome friends who are on the look out for articles that I may want to blog about. P.S. Everyone should get a podiatrist friend. Mine is awesome, because not only is she an excellent doctor, she is also really good at cribbage. Almost as good as me. And if I ever get a cribbage injury, she’ll probably treat me for free. Although she won’t because she’s not allowed to treat anything but the feet. So if I get a cribbage injury in the lower leg -- say I accidentally step on a cribbage peg -- I’ll surely be saving some cash money. I love my friends. The CLINICAL RESEARCH section in this month's Foot & Ankle is about plantar fasciitis. Localized means that the whole structure is not suffering from inflammation, just at a particular point, anatomical insertion means where the tissue attaches to bone, and the calcaneus is the name of the heel bone. Well, it kind of looks like this. I just made this using the "shapes" feature on my computer. I don't think the big toe is typically twice the size oh the heel but beggars can't be choosers. Or is it bloggers can't be artists? What got me so excited it that this is the first study that has looked at tension in the hamstrings (the large muscles down the back of the thighs) and the relief patients are getting from plantar fasciitis with focused hamstring stretching. The say a picture is worth 1,000 words. Let's see if they are right. Moral of the story: Tight muscles eventually lead to damage of non-force generating tissues like bone, ligaments, and fascia. Next week: HOW to stretch the hamstrings correctly. Photos are © Restorative Exercise, Inc. Feel free to use, just please list source. Thanks! Labovitz, J.M. 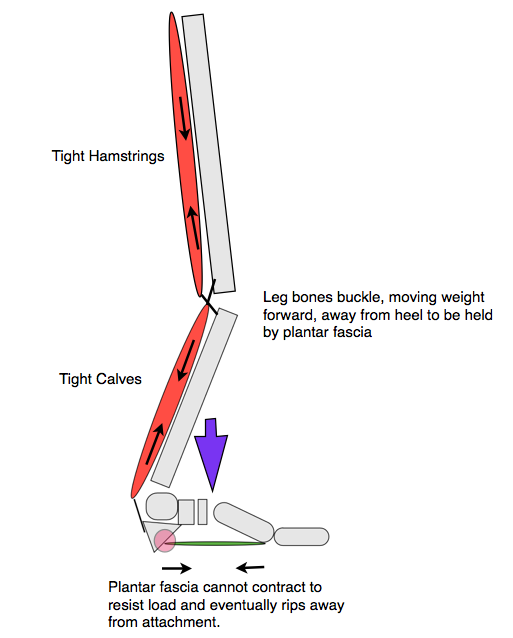 ; Yu, J., and Kim, C. "The Role of Hamstring Tightness in Plantar Fasciitis," Foot & Ankle Specialist, June, 2011, vol. 4, no. 3, pages 141-144.